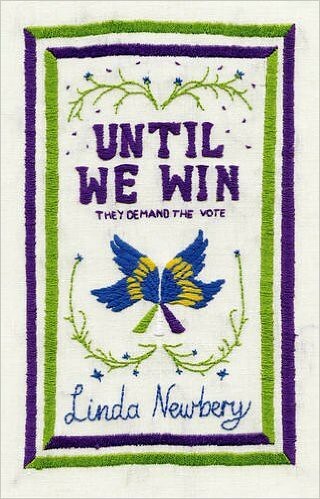 Linda Newbery’s new book title for Barrington Stoke – Until We Win – takes on even more meaning than perhaps was intended when she wrote her short but engaging story about the suffragette movement. We keep being reminded of how important it is not to waste the vote, that so many women worked so hard to win for us. Don’t be complacent and stay at home, in the belief that voting doesn’t matter. It does, and we are seeing the effects in spades these days. Lizzy works in an office when she meets a couple of suffragettes and is taken on by their group. At last there is something vital that she can do! Lizzy marches and ends up in jail, where she goes on hunger strike. At work Lizzy befriends another young girl, whose life also changes with the help of the older suffragettes. And in the midst of their campaign for votes, war breaks out and they have other work to do. Linda’s story is fairly low key, but all the more powerful for it. We need fairness more than ever, and those who are looked down on must be given equality. We were sorting the bookcases. Again. I have done bits of it on my own, but if any serious work was going to happen on the top shelves, especially forming a second row behind, then I needed the Resident IT Consultant. And I’m sure he was pleased to be needed. Climbs well, and can hug a larger pile of books in one go than I can. My job was to tell him what to do and where, and to choose a few books that would be put up for adoption. The Ns happen to live on the second top shelf, the one to the right of the As and Bs, and not having been a double row before, on account of stability, they were all out front. ‘Here are some Newberys,’ he said. ‘And some more. Oh, there are a lot of Newberys,’ he said as the full range of Linda’s books hit him. Not literally, I hasten to add. The very awkward Gs improved a lot with our work the other day. I may have mentioned before that there are many Gs in my book world. There were McMacs coming at us from all directions, but they are more orderly now. In some instances he had me worried when saying he thought there’d be more of someone’s books. I thought so too, until I recalled that this is what my bedside special bookcase is for. The bestest of the favourites live there. It also turned out we were both alphabetically challenged. We discovered several books that needed to move left. And then a bit more left, before going furher left where they belonged. We must be getting old. This was the kind of job you put off and put off because it strikes you as hard work. In actual fact, we only needed a couple of hours, and some of it was me sitting down to think about my books. And then, of course, I had to go and do my best of list and I wanted a photo of the selected books of 2016, so I had to pull them out again, on my own, and put them back. But at least the sorting meant I knew where to find them, even if it was the top shelf. 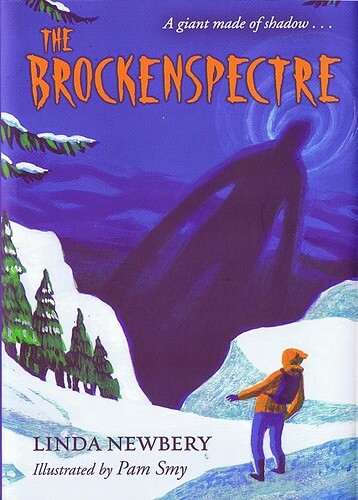 I don’t mind telling you how scared I was when reading Linda Newbery’s new book The Brockenspectre. I do have a special fear of snowy ‘adventures’ where people slide about on snow-covered mountains. And this is a very wintry story, with scope for sliding to your death. Or not. It is good. Very, very good. But scary. At least for me. 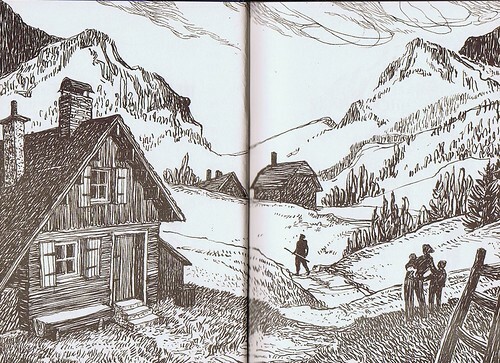 This is the tale about Tomas, who lives with his family somewhere in the Alps in a small village, away from it all. He and his toddler sister Johanna have a lovely mother and a charming, mountain-loving father, Pappi. Tomas admires Pappi above everything, and Pappi teaches him about what to do and not to do when in the mountains. And then one day Pappi walks out and doesn’t return. In the end Tomas can’t stand it, so goes after him, despite being scared of the Brockenspectre; an unknown, but scary, creature who lives in those mountains. He goes alone, in the cold and the snow. He knows he shouldn’t really. Especially the alone bit. It is magical and realistic at the same time. I can’t tell you what happens; whether he finds his Pappi, or if things generally go well or badly. It’s nail-biting stuff, but also charming in a nicely old-fashioned way. 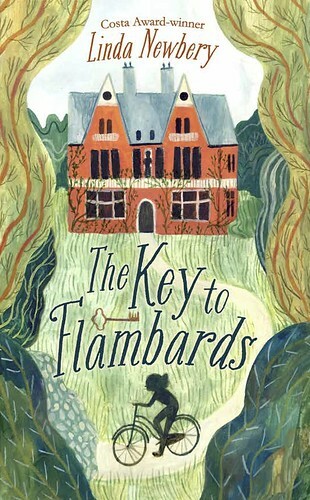 Beautiful illustrations by Pam Smy, without whom this book wouldn’t be the same. You can’t get into Charlotte Square before 9.30. I’d do well to remember that, and I could – and should – stay in bed for longer. 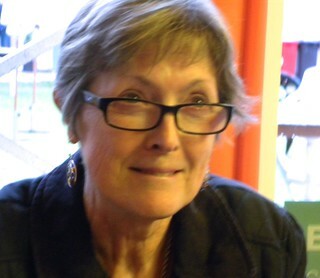 But a witch can always read, so on Tuesday morning time was killed with Theresa Breslin’s Ghost Soldier. Thanks to Theresa’s generosity I was able to be her husband for the morning. Not as nice a one as her regular Mr B, but I did my best. And I can confirm that while I was in the authors’ events prep area, I didn’t hear anything. At all. Eating a sandwich very fast before my next event, I ended up letting four Swedes share my table. I didn’t share my Swedish-ness with them, however. I listened as they speculated on the nature of Charlotte Square. Apparently it’s a bookfair of some kind. ‘But where are the books?’ one of them asked. Quite. The book festival as a mere coffeeshop for tourists. Ran into Keith Charters, who was clutching 60 copies of David MacPhail’s Yeti On the Loose. Did some heavy hinting, which resulted in Keith handing over 59 copies to the bookshop. I mean, he had promised me one ages ago. 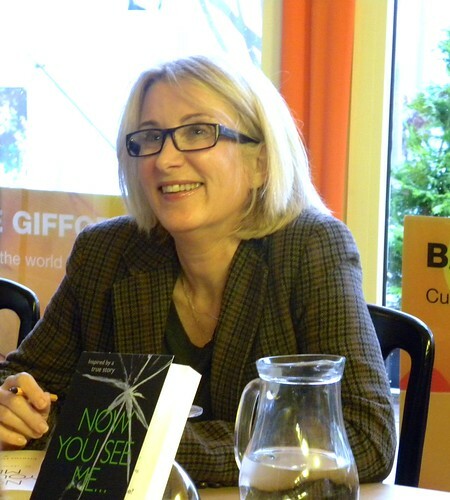 After school event no.2 I chatted a little with Linda Newbery, Tony Bradman and Paul Dowswell, getting my anthology signed by all three, each in the right places. Then went in search of Cathy MacPhail’s son David, and found him where I thought he’d be but not where Keith had said, along with his mother and a lovely baby. I’d been told he’d be a slightly taller version of his mum, which as Cathy drily pointed out wasn’t hard to achieve. I forgot to take a picture, but got my Yeti signed with an extra generous RAAAAAR! Then I admired the baby. Wrote yesterday’s onsite blog post, before learning that Son and Dodo were coming over to entertain me, and to have coffee. It had got unexpectedly warm and sunny, and Son complained. We chatted, saw Ian Rankin arrive, noticed the longbearded gent from earlier years, and came to the conclusion that the scones which used to be of almost home made quality, were just dry and boring. 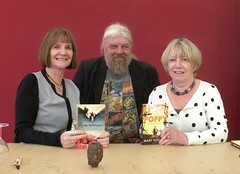 Son and Dodo went off to search for more Maisie books, and I had my Dyslexia event to go to. Glimpsed Nicola Morgan and Val McDermid (not together) and then it rained and got unexpectedly cold. I repaired to the yurt for a restorative sandwich and an even more restorative sip of cola to keep me awake, as well as find that cardigan I suddenly needed. 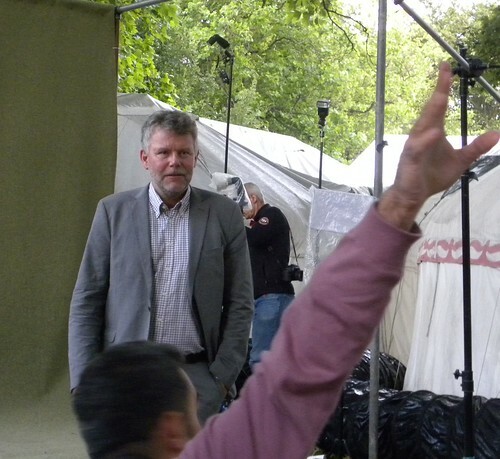 Waited for Arne Dahl to turn up for his photocall, and did the best I could when he did, considering how dark and wet it was. He seemed bemused by the attention. While waiting for Arne’s event with John Harvey (whom I’d have snapped too, had I known who he was…) I walked over to the children’s bookshop and caught Anne Cassidy and Emma Haughton (who does not have long brown hair, after all) signing post-event. And after a much longer day than someone my age should attempt, I limped along Princes Street for my late train home. Someone at Waverley told me to smile. He’s lucky I’m a peaceful sort of witch.